Super Bowl XLV is coming February 6, 2011 and NFL Enterprises have released their free iPhone app as an official guide to help keep football fans informed with a 3D map of North Texas. The app will help visitors find local restaurants and sports bars as well as the Cowboys Stadium and its facilities. If you really like planning ahead of time, you can use the app to locate your parking, concessions, and even restroom breaks ahead of time. Keep in touch with your friends and snoop on others by seeing who’s checked in on game day. Be sure to grab this app in advance, because it does a pretty big download on first launch which you should do over WiFi probably. The 3D mapping technology in the Super Bowl XLV iPhone app is pretty hot. Use 1 finger to slide around the screen. Rotate around by rotating 2 fingers or tilt the view up or down by swiping 2 fingers up and down simultaneously. Pinch to zoom in and out. 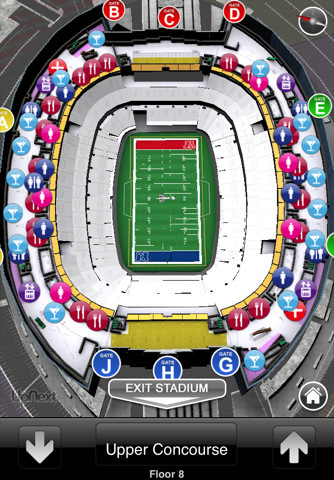 Tap the stadium to enter and view it from the inside. Once inside the stadium you can tap the up/down arrows to go up/down a floor or seats. If that wasn’t enough, you can tap on any building to get a list of its services. There’s also a button to locate where you are and you can also find stuff by keyword. Let’s just hope that your ATT or Verizon (yes the Verizon iPhone will be out Feb 3rd) has good signal while you’re in the area. What is a little strange about this Super Bowl app is that it has absolutely zero information about the actual football game itself, the teams, the coaches nor anything having to do with the players. Even if you’re not planning to go to the North Texas area to watch the Super Bowl, downloading this app is fun enough just to play with the 3D mapping software. Here’s hoping Google Maps uses some of these ideas in its future releases. 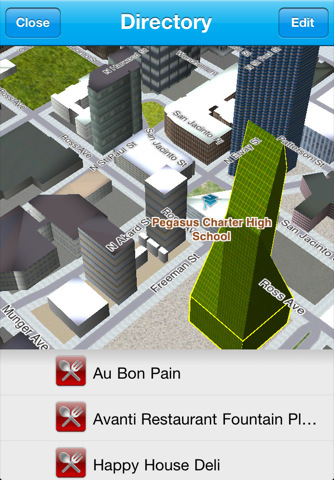 Note: The 3D mapping tech is done UpNext, and incidentally they have their very own iPhone app as well which gives you access to the following cities via UpNext 3D Cities (iTunes Link): New York, Chicago, Philadelphia, Portland, San Francisco, Boston, Washington DC, and Austin with more cities coming soon. AppSafari review of Super Bowl XLV was written by Joe Seifi on January 28th, 2011 and categorized under App Store, Events, Free, Local. Page viewed 3820 times, 1 so far today. Need help on using these apps? Please read the Help Page.